Because both my parents had some sort of musical background, music was always a big part of my life. My mother played the piano at home and, although she was not an organist, she played hymns on the organ at the local village church. I would sit on the hard wooden pew and absorb the church paintings as she played. I was lucky to have been brought up in a time when our family get-togethers was spent singing songs, dancing, telling stories or even reciting poetry in Doric. We actually enjoyed power cuts in the winter time because they added further excitement to our creative processes when the lights went out and we just had candles to see by. I continue to enjoy engaging with audiences for the same sense of creative excitement. Throughout my education I consider myself very fortunate in that my schools offered free music education to every child. I began to play piano at the age of 8, followed by clarinet at 10. 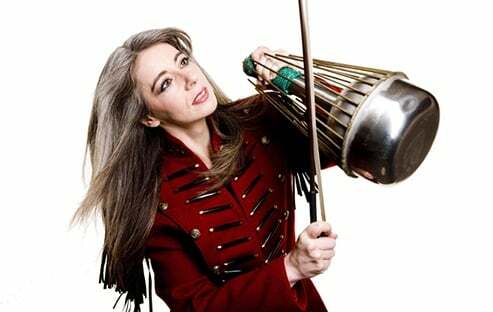 After seeing the school orchestra playing I focussed my time on percussion from the age of 12. I was so impressed that I immediately knew I wanted to be part of it. 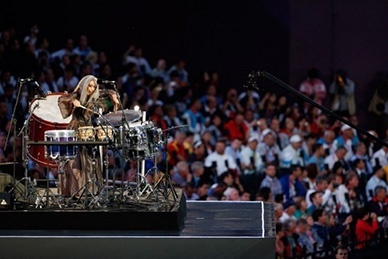 You played at the Opening Ceremony of the Olympic Games, with more than a billion people watching you - what did that feel like & were you nervous? In a way it felt like I was about to go on stage for the first time! Audiences and venues are always different, wherever you are in the world. The acoustics in a performing space are never the same either. The ‘butterflies’ are always there to keep me focused and energized. Oddly, I always find performing a good way to analyse how I react to stress and release, both physically and mentally. Performing also gives an opportunity to engage with the audience in a way that’s not possible by any other means. Witnessing their reaction to a sudden change in sound or to changes of instrument has always fascinated me. Where’s the strangest place you’ve played? There have been plenty, but the ones that immediately come to mind are Grand Central Station in New York, where I was allowed to perform Áskell Másson’s Prim, and playing in a number of prisons. It was wonderful seeing the people’s reaction at Grand Central Station as I was playing but, most of all, it was impressive how the building was resonating, transporting the notes all the way to the gates. Watching bystanders admiring this, as they tried to follow the notes all the way to the ceiling, made the experience even better. Still, playing and talking to inmates in 11 different prisons, must be acknowledged as, at the very least, a strange experience! There, women, men and youngsters, regardless of their background or offences, have always shown curiosity and respect for music. Of all those visits, the one I cherish the most is Cornton Vale Prison, a women-only prison. I was surprised by how receptive the women off all ages were. Even though several had never experienced classical music, they were so touched and even asked me to use my influence with the governor to get them a prison band! What was it like working with Oscar the Grouch on Sesame Street? Exciting! As soon as I entered the building, and walking through the corridors, I could feel the creativity bubbling. Meeting all those childhood characters, being able to touch and talk to them, made me feel like a silly fan-girl! The best bit? 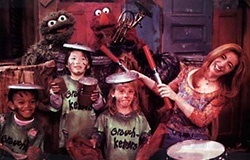 They never broke character, they were always Oscar the Grouch, Elmo, the Cookie Monster [I just wish I could have shared a pack of cookies with him! ], Grover and so on. I felt like that corner of Sesame Street and its habitants were as real as me. You lost your hearing when you were young. How did you learn to lipread? I learned to lip read out of necessity. I’ve always been able to perceive high sounds more easily, but mid-range and low sounds have become a cacophony. Anyone who has mild deafness will find it difficult to follow speech in noisy situations, something most of us have experienced in noisy public spaces or on a busy street. When I was a child I would watch television programmes dedicated to lip reading with my mum. These were always shown on a Sunday morning. After each programme we would look in a mirror to practice the lip shapes that words form when we speak. Now I’ve learned to rely on lip reading in daily conversation. What’s the strangest instrument you own? The strangest is definitely not one that I ‘own’. 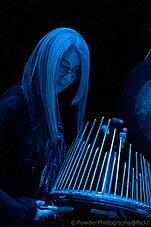 I’ve always enjoyed playing with my environment and all that is around me, discovering new sounds and resonances. The sound you can get from a tree, a pebble or even a running stream of water can be surprising. The same with rain dropping, leaves crackling under your feet or birds chirping. and the myriad of sounds found in a kitchen [wooden spoons on a cooking pot can make for a brilliant drum!]. Because I have this curiosity in me, I find myself unable to throw away any damaged instrument. I will always try to make a new instrument out of broken ones. I also like instruments made out of found objects. One of my most prized possessions is a Wrenchaphone, which has turned everyday tools into an exquisite instrument. How can I become a solo percussionist? The best advice that I can ever give anyone is to not give up. Even when it seems impossible to carry on. You are the best tool you will ever have, make the best of it. Invest in your education, practice like your life depends on it – because it does. And always keep an eye out for opportunities. Do not rely or expect anything to happen from others – create your own path and be part in as much as you can. And finally... what are your favourite 5 pieces of music? Johann Sebastian Bach’s music as a whole. It’s so easily adapted for a large array of instruments without losing its fresh sound, which makes it universal and timeless. instruments in a free form. Nimrod by Edward Elgar, a piece of music that never fails to tug my heart strings. Growing up, ragtime music, played an important part in my musical development.